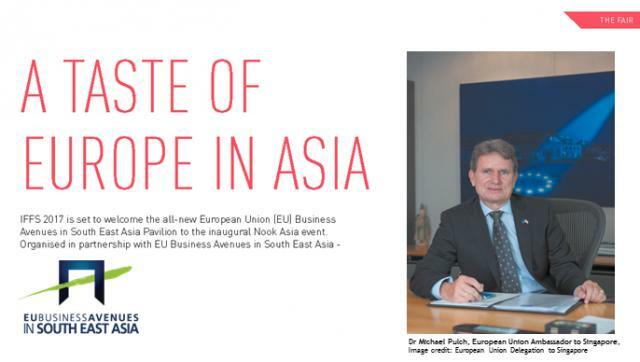 IFFS 2017 is set to welcome the all-new European Union (EU) Business Avenues in South East Asia Pavilion to the inaugural Nook Asia event. Organised in partnership with EU Business Avenues in South East Asia - a business support programme for Europe-based SMEs to establish business collaborations through business matchmaking and support services in South East Asia, the pavilion will house 50 design & interior companies from across the European Union on the Contemporary European Design business mission. If you are looking to incorporate some stylish and sleek European pieces into your interior décor, the pavilion is definitely not to be missed! Learn more about EU Business Avenues in South East Asia in this exclusive interview with Dr Michael Pulch, European Union Ambassador to Singapore. 1. The first business mission to ASEAN took place in 2015. How was the response from the industry and has it resulted in any successful partnerships or deals? Based on the survey we conducted with the European companies after their participation in 2015, we gathered that the business mission was very successful. Participating companies' satisfaction levels were very high, and 81% of them indicated that they had established new business contacts after visiting the region. A notable example is Domitalia, an Italian manufacturer of contemporary furniture for the home and office. The company signed two business deals here in 2015, which included one order from a local retailer valued at EUR 26,000. 2. Why did the EU Business Avenues in South East Asia choose to collaborate with IFFS? ASEAN is a growing consumer economy. From now until 2030, the middle class is expected to account for approximately 80% of the growth in global spending. Singapore's furniture industry has also expanded rapidly over the years, with home decoration and environmentally-friendly products gaining popularity among consumers. We recognise that the opportunities presented by a rapidly urbanising, more sophisticated, and more affluent ASEAN region should translate into demand for furniture and furniture solutions. IFFS is Asia's premier sourcing platform and design-led exhibition, with a proven track record. As a Singapore-anchored trade event, IFFS attracts a well-represented attendance of regional trade buyers. This event presents great opportunities for European design companies to establish contacts with local players and discuss possible collaboration and business partnerships. Hence, it is naturally the preferred choice for us to collaborate with IFFS in 2017. 3. What can trade visitors to IFFS 2017 expect from the EU Business Avenues in South East Asia Pavilion? European companies are at the forefront of modern interior décor. Globally, they are regarded as trendsetters and their creations are valued for their excellent craftsmanship backed by innovative ideas. We have chosen to showcase some of the best SMEs of this sector the EU has to offer at IFFS 2017. Visitors can expect a comprehensive showcase of furniture, interior lighting, finished home textiles, wallpaper, carpets, and decorative items such as pottery, high-end design tableware, and cutlery. Hungry for more? In addition to the pavilion, the EU Business Avenues in South East Asia will be holding a technical seminar at IFFS. Learn more about the latest products and innovations from participating European companies. Visitors will also get the chance to mingle and network with European companies in an exclusive business networking reception on 10 March. Participation in these events are free of charge. Visit www.eubusinessavenues. com to pre-register your interest!